The list goes on and we advise that you work with a reputable stainless steel fabricator. For the home handyman I encourage you to search the internet for help with specific applications. Someone out there, somewhere, sometime, has almost invariably done what you want to do and is only too pleased to tell you about it via one of the many stainless steel or welding forums. Fine stainless steel meshes can be welded or soldered. Larger meshes can be welded, clipped or tied. 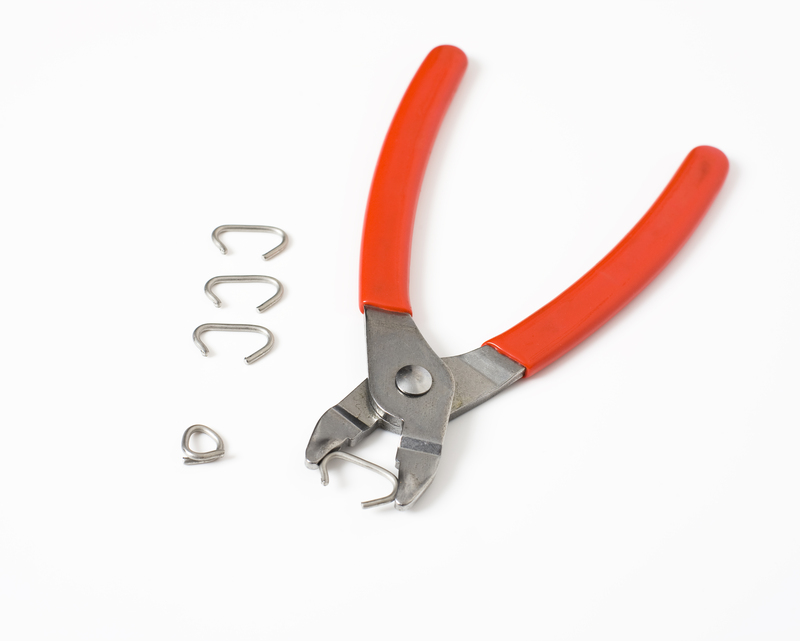 We stock stainless steel “C” clips and closing pliers. The clips are made from 2mm, 316 grade stainless steel wire. Fine stainless steel meshes can be tacked using a spot welder, or seam welded using a spot welder with a roller electrode, as shown in this video clip by Sunstone Engineering https://www.youtube.com/watch?v=ZJeLSl2I1oo. A simple DIY seam spot welder is shown in this video clip by Welding Sciences https://www.youtube.com/watch?v=uztiVJxeOVw. Metal Inert Gas (MIG) welding, also known as gas metal arc welding is effective in the joining of stainless steel wire and mesh. The technique uses an electrical arc, as does a spot welder, but also uses a mix of argon and CO2 gases (called a shield) to prevent atmospheric contamination of the weld. TIG (Tungsten Inert Gas or gas tungsten arc) welding can also be used. This is similar to MIG welding but, whereas MIG welding uses a consumable welding rod, TIG welding uses a non-consumable tungsten rod and a separate, consumable filler rod. TIG welding requires considerably more operator skill than MIG welding but there are TIG welding machines that automatically feed the filler rod, making it easier for the operator to achieve a high quality weld. 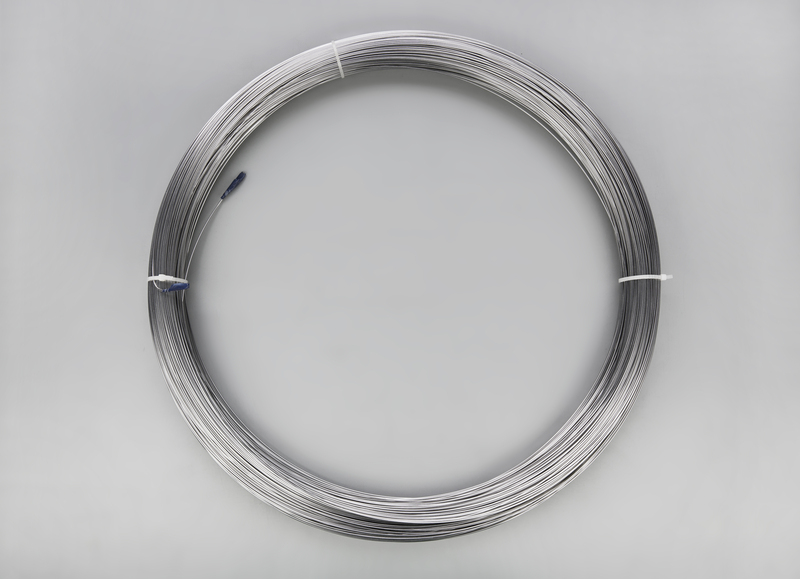 We have a range of stainless steel annealed tie wires which can be used to join stainless steel welded panels and stainless steel welded rolls. The range includes 304 and 316 grade stainless steels between 0.4mm and 4mm diameter. The annealing process makes the steel more pliable so it can be easily twisted. 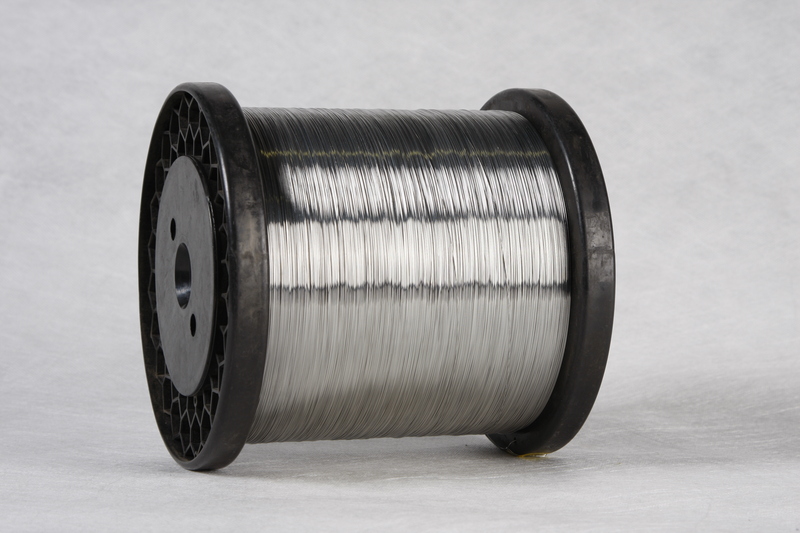 Stainless steel meshes can easily be soldered but stainless steel has a very low thermal conductivity so applied heat will not flow out from the gas torch or soldering iron. While this means that more skill is required, it also means that molten solder is less likely to flow onto areas that you do not want it. This video clip from American Beauty demonstrates the joining of two pieces of stainless steel mesh using solder https://www.youtube.com/watch?v=aJEFf2Ogy0Y. A family wire business- really just another member of the family! Growing up with a family business what was it like? Possibly the best analogy is that it was like another member of the family and still is! At Christmas time work had to be considered just like family- who would answer the phone, respond to faxes now generally emails, water the garden, collect the mail, do the banking etc. A family business has played an integral part of our lives. Considering it is second nature to us and it has been a great vehicle to provide values. Dad has always enjoyed work which has been passed onto us and the importance of hard work. If we didn’t have a family stainless steel wire business I wonder if I would have made a wire Christmas tree? Probably not! Over the years as a family we have used wire for all sorts of things- birthday invitations, many table decorations, doors, endless uses in our garden- last weekend Dad just built a fence to keep the wallabies out of Mum’s newly planted trees and now a Christmas tree! We would like to wish you all a wonderful and safe festive season and a happy new year. Thank you for your continued support and we look forward to supplying your stainless steel wire and mesh needs in 2016. Bushfire Mesh- Explained and where to find Information? Many areas of Australia are subject to summer bushfires which cause loss of life, livestock, homes, farm buildings and infrastructure, and cost the country millions of dollars every year. In Victoria in 2009, what became known as the Black Saturday bush fires, prompted the development of Australian Standard 3959-2009 (Construction of Buildings in Bushfire Prone Areas) which gives people who are building, re-building, retrofitting or renovating their homes, a clear direction on how to better protect their homes against bushfires. Ember Attack – Embers are carried by strong, hot winds, many kilometres ahead of the fire front, and can enter a home through gaps as small as 1.8mm, igniting flammable materials, particularly leaf litter. Radiant Heat – The intense heat from a close proximity bushfire dries out vegetation ahead of the fire, cracks and breaks windows, and melts and distorts plastic, again allowing gaps for ember ingress. Direct Flame Contact – The fire actually touches the building and sets it alight. Flame Driven Wind – During a bushfire, winds far in excess of normal are generated by the fire itself and can cause trees to fall on buildings, break windows, and loosen roof tiles (allowing embers to enter the roof space). Ember attacks cause 80% of home loss during a bushfire, so anything that can be done to stop ember ingress, is going to be very effective in reducing the risk to your home. 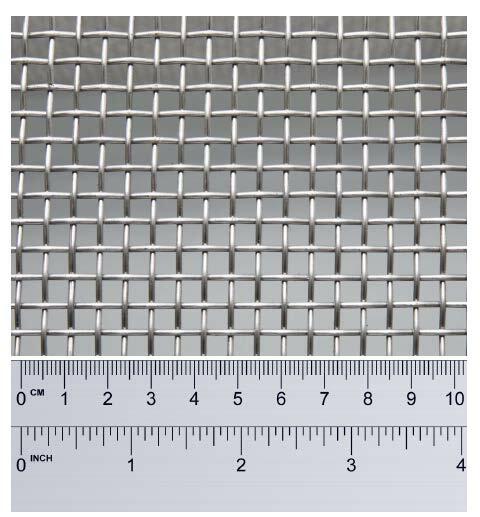 AS3959-2009 specifies the use of a corrosion resistant steel mesh with an aperture of less than 2mm. This can be used to protect windows, skylights, doors, decks, patios, evaporative cooling units, gable and roof vents, gutters, eaves and downpipes. A radiant heat bushfire mesh not only prevents ember ingress, but also reduces the intensity of radiant flux by approximately 50%. Ember Attack Vs Radiant Heat- this is a great video. Jack Cohen, Fire Sciences Researcher, Fire Sciences Lab. 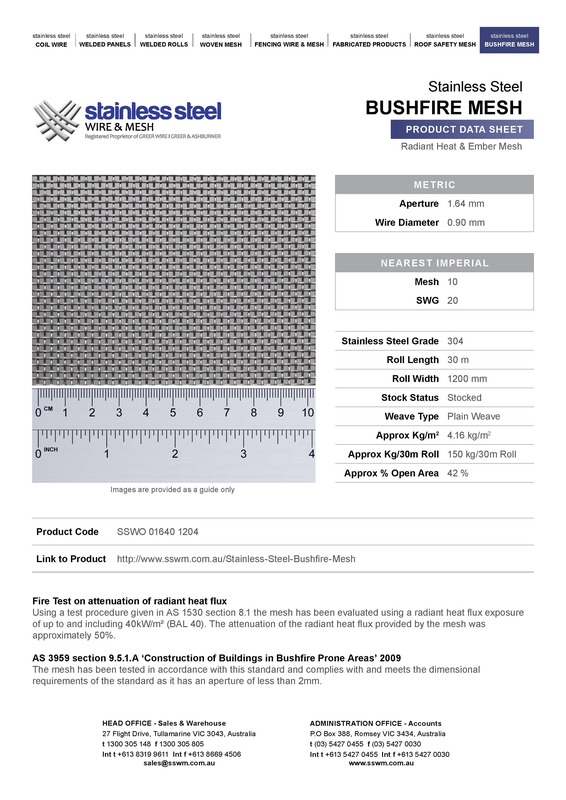 At Stainless Steel Wire & Mesh we have several stainless steel woven meshes that meet the AS3959 specification. 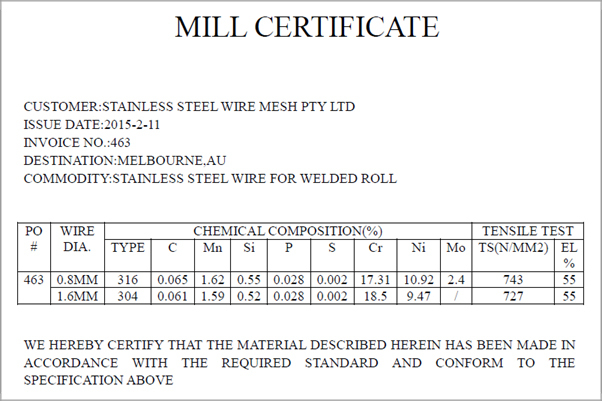 These can be found on our website- Bushfire Mesh along with data sheets like the one below. AS3959 specifies six bushfire risk categories. The BAL (Bushfire Attack Level) system is based on the potential danger of the site and construction materials, which considers the Fire Danger Index (FDI), vegetation type, distance of the site from vegetation, and the slope of the ground under the vegetation. Further information can be found on our website- Bushfire Mesh- More Information. The Victorian Building Authority website has very useful information, including “A Guide to Retrofit Your Home for Better Protection from a Bushfire”. 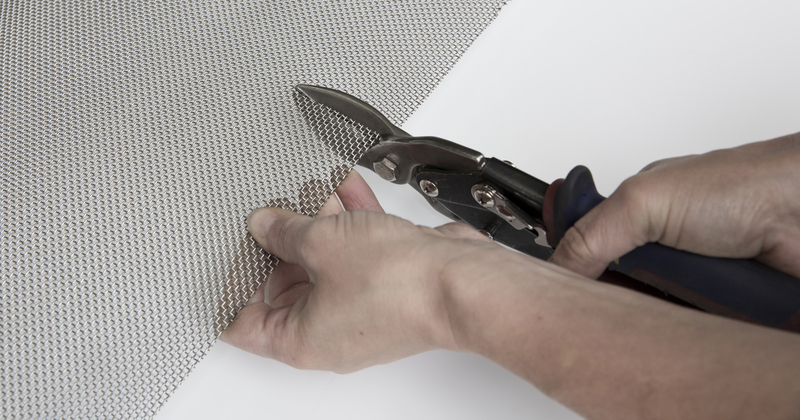 How to cut your Stainless Steel Welded Mesh & Woven Mesh? 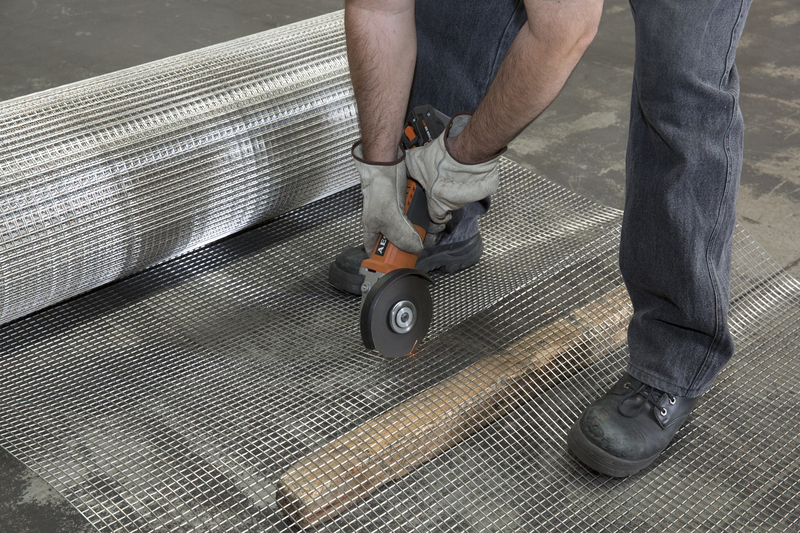 We are often asked how to cut stainless steel welded mesh & woven mesh and the answer very much depends on the wire diameter. 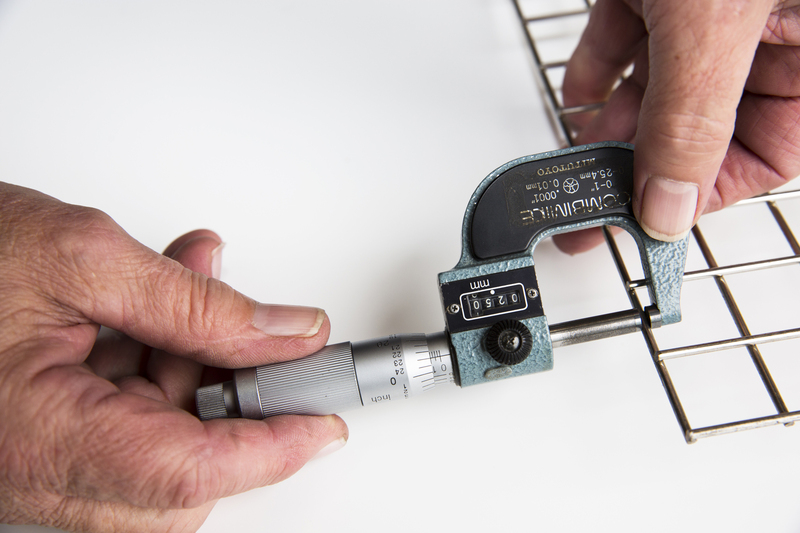 The smallest wire gauge that we stock is 0.025mm diameter which is thinner than the finest human hair and obviously doesn’t need to be cut with an angle grinder. 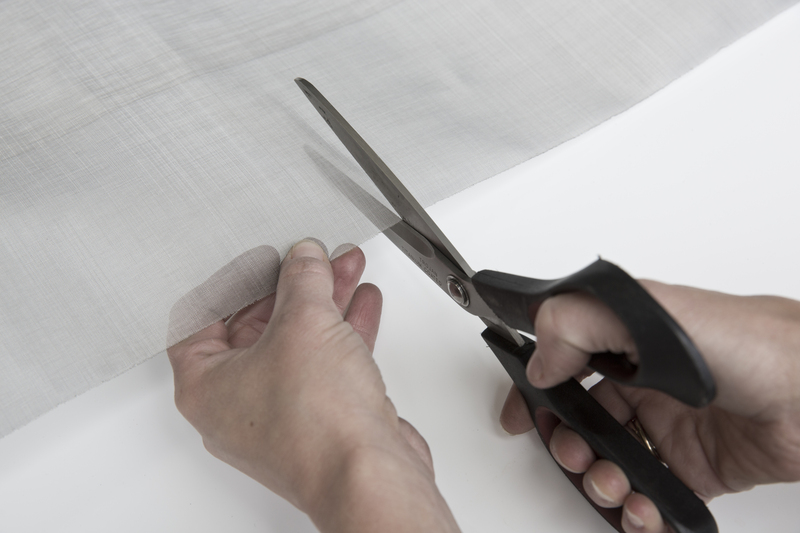 In fact, the finest meshes are easily cut using a pair of household scissors. At the other end of the scale, our largest wire diameter (6mm) does require an angle grinder. In between, there are mesh sizes that are best cut using tin snips. When using an angle grinder, the cutting disc should be 0.9mm thick and of a type suitable for cutting stainless steel. Remember that an angle grinder typically operates at a speed of 10,000 RPM so take appropriate safety precautions. Wear gloves, safety glasses and hearing protection, and keep other people out of the vicinity when you are cutting. % Open Area – the ratio of the aperture area to the total mesh area (calculated from the aperture and the wire diameter). Now that you have got your head around the above! In an earlier post The ‘Ins and Outs’ of stainless steel woven mesh- Part 2 we discuss formulas used for identifying mesh! 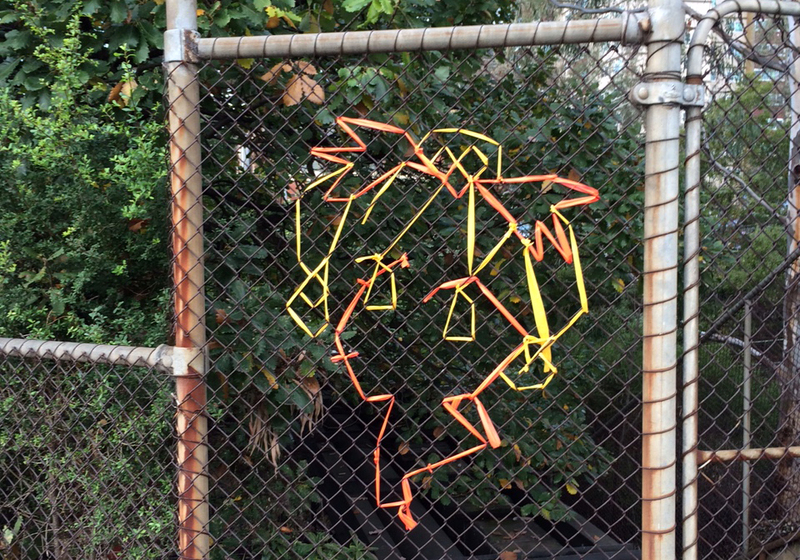 Wire Wanders…have you seen any? Chainlink mesh urban art in Melbourne. 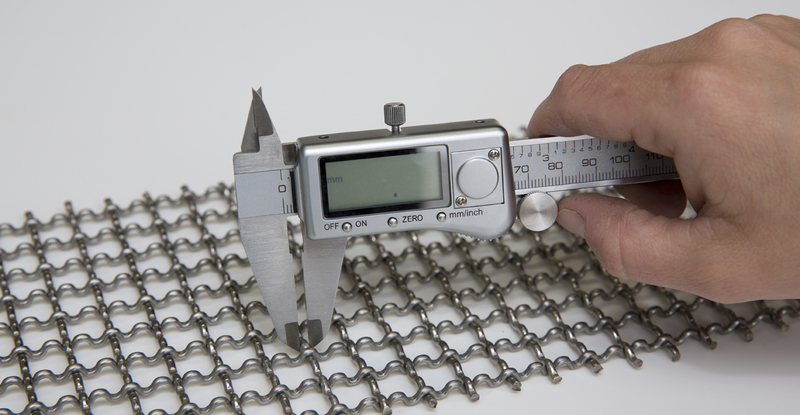 One of the many benefits of stainless steel chainlink mesh is that it wont rust like this. Since 2002 Tory, James and I have worked with Dad- Andy and Mum- Lea in Stainless Steel Wire & Mesh. Prior to that Tory and I worked with Andy in Greer Industries- a wire manufacturing company. Dad has always been incredibly passionate about stainless steel wire- sometimes I wonder if it runs through his blood, probably not far off as he has now being working in the industry for at least 45 years. I think it’s fair to say he loves it and we can’t imagine him ever retiring! So it’s not surprising that it has rubbed off on Tory, James and I. We often find ourselves drawn to different uses of stainless steel wire and mesh that we find in our wanders. 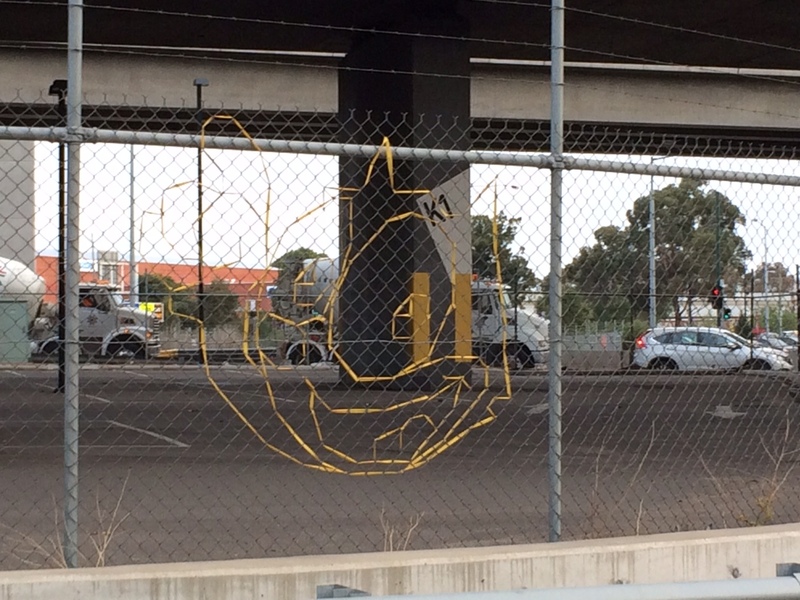 I recently noticed this Chainlink Mesh urban art popping up around Melbourne- it may not be stainless but is an interesting use of Chainlink Mesh- we do stock Stainless Steel Chainlink Mesh. I pointed it out to my three year old son who suggested I take some photos to show Andy. Over the years we have supplied many artists and sculptures with stainless steel wire & mesh- stay posted. 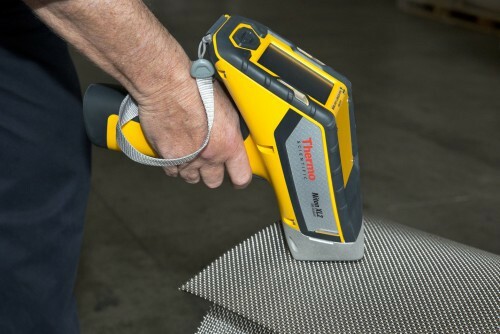 How to Test if your Stainless Steel is Grade 304 or 316 Wire?